In 2015, I had the great opportunity to do an internship in Rwanda: Inyange Industries and Bourbon Coffee houses. I am a trained Pastry Chef (international bakery and confectionary) with further study of food technology. I organised these two internships by myself, privately (without help from international internship organizations). Both internships together lasted 5.5 weeks. During my stay in Rwanda, I did not want to live in a hotel as I felt that is something for tourists. I wanted to live in the midst of the society, I wanted to get to know how Rwandan people think, how they are and how they see the world. Marie- Paule, that is her name, didn’t know me before, but from the beginning she treated me like a family member. I gained insight into her daily structure and after a while she told me more about her life. Marie Paule was 13 when her mom (a Tutsi) died in the Rwandan genocide in 1994. Her mom was killed in front of Marie-Paule’s innocent, young eyes. Her father (a Hutu) survived, he was known as “a good man”, integrated into the society, even when he married a Tutsi woman. That is why they spared his life. Marie -Paule became a fighter, studied hard and did well. Her father tried to do everything to enable her to have a good school education. She reached a Bachelors degree, studying political and administrative sciences. She got married and gave birth to two children, Boris and Brian. After several years, and after a change in law (Rwandan women got the right to get legally divorced from their husbands) she applied for a divorce. As she told me, her ex-husband did not work (he was able to, he just did not want to), and all the money they had was from Marie-Paule’s income. He didn’t look after the children, but spent all the money for himself. The family had a good income, but was simultaneously poor. In Addition, all responsibility and family organisation weighed heavily on Marie-Paule. Getting divorced as a woman in Rwanda is legally accepted, but within the society she experienced trouble. Many family members did not agree with her decision, but she went through it, never giving up on a better life for herself and her two sons. When I lived with her, she was already employed for 3.5 years with the American Refugee Committee as Human resources, Administrative and Communications Manager. She earned enough money to pay rent for a small house, having a nanny and a houseboy who were looking after the kids and doing housework while she was working from 8am to 6pm. Her elder son, Boris, went to a private Christian school. Despite the fact that education is free for everyone in Rwanda, the level of the education they get is one of the lowest in the world. According to the Human Development Report (HDI, 2010), Rwanda is ranked at 152 out of 169 in “low human development” categorised countries. So families try their best and work hard to send their children to private schools. The better the education a child receives, the better it is for the whole family in the future. Legally, Boris’ father is responsible for paying for his son’s educational development, but he does not. Marie-Paule has never asked him for money for herself or for feeding the children. She only asked for him to give educational support for his son – to pay tuition fees directly to Boris’ school, but for many years, he has refused to offer any support towards his son’s education. I got to know Boris well when I stayed in Marie-Paule’s home. Every day at 6pm he arrived home from school. He ate something and then he sat down and did his homework. He was 7 years old and in Primary 1. I was amazed. 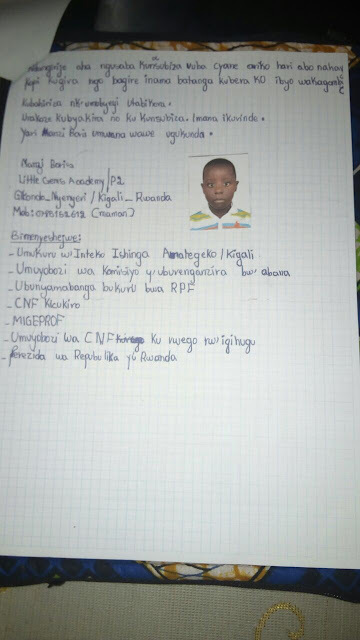 He spoke fluent French (his mom taught him), quite good English and, of course, their national language Kinyarwanda. He was very focused on school and his marks. He told me he wants to become a physician. 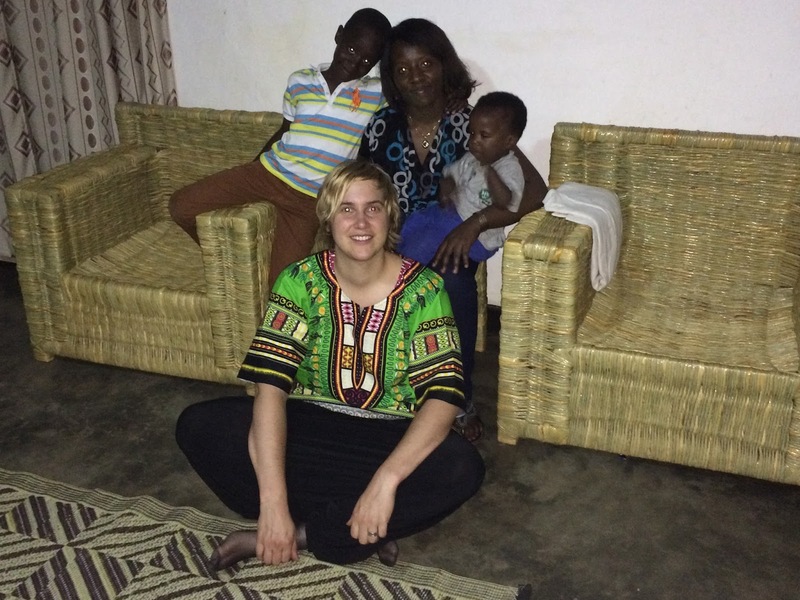 Marie- Paule has managed these hard situations well, but in early 2015 something changed. She got a new manager at work and felt that things began to change with obligatory remarks, misunderstandings, feeling of harassment from her manager and some other colleagues. On a Thursday in August 2015, Marie-Paule’s manager gave her a letter saying that she had to leave the city of Kigali and move to Huye within three days. The company would give her around $280 for relocation costs. She had to start a new job within the company, which was a demotion from a management position to an assistant’s role the following Monday. 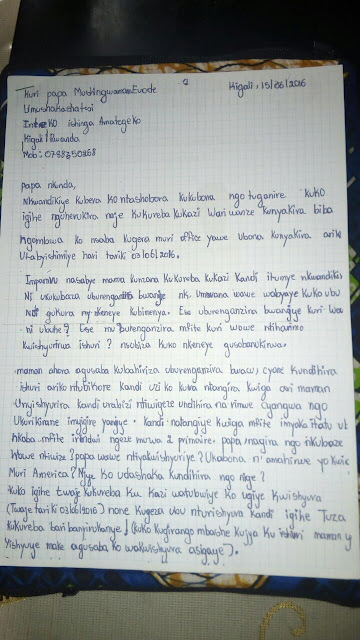 She refused because Huye is located in the south of Rwanda, 134 km away from Kigali, taking around 3-4 hours to travel there by car. Her son went to school in Kigali. She had a houseboy employed, a flat for rent. She was not able to organise this kind of movement with her family in only three days (I saw this letter myself and would not have believed it otherwise because things like this are just not legal in the Western world). Three months later, she was without a job in a place where unemployment runs ramped, even for well-educated individuals. In 2012, Rwanda’s unemployment rate was only 3.4%. Now, in 2017, the unemployment rate has increased to 13.2%, which is the highest rate in many years (1). Without a job and no income, Marie-Paule had to let go her houseboy, move out of her home and leave Kigali with her two sons. Boris was no longer allowed to attend his school because the school fees were no longer being paid. Marie-Paule had only one family member who supported her, her aunt in Gisenyi (160km away from Kigali), who hosted Marie- Paule and her children, Boris and Brian, in her house. They have lived there for 1.5 years now. Today, Boris is going into a public school. Marie-Paule told me that Boris is mentally very frustrated. He wants to become a physician and with joining a public school, he knows that his education quality decline and his chances to meet his goal are lower. But still, his marks are still very good because he still tries to learn as much as he can. I started this campaign to support Boris’ education, to raise funds to pay for private school fees, so that Boris has the best possible chance of realising his dream of becoming a physician. For his remaining Primary years, he will join the Kigali Parents school, which has a good reputation and is known for its good basic education. For his education in secondary school we chose the Nu-Vision High School. Nu-Vision High school is a boarding school with international classes: It is an accredited Cambridge International School and accredited to ICDL. In Rwanda, 1 term is 3 months. (increase of prices are not included now- In case, we make sure that with our personal financial part of the project it will be covered as well) – That is our goal! Let us make this happen! If we do not reach this high goal, Boris will be sent in another, cheaper boarding school, with less advanced facilities but with still good education guaranteed. Of course, we try to do our best to get him an education which his equivalent to the education what we got in our western, developed society. Why not giving him the same chance in our life, like we had? The more money we can raise, ensures more years of quality education for Boris. A quality education will help secure his and his family’s future, financially and in quality of life. With your donation, you will not only supporting a bright, dedicated and hardworking young Boris, but also his mother Marie- Paule and brother, and his own future family. Dear Dad, I would like to ask you if you have never gone to school, didn’t your parents pay for your education? I addition to that , you were lucky to continue your studies in Africa, so why don’t you want to pay for me? When we came to see you at your office, you aid that you were going to pay for me but you never did, up to now. At that time I was not allowed to join school anymore (Lack of payment, that was in June 2016). I am closing here requesting you to kindly give me your feedback as soon as possible. I have given copies to some people to advice on this case because you do not fulfil your responsibilities as a parent/father. 1. Trading economics. Rwanda Unemployment rate. [Online] 2012, 2017. [Cited: 04 06 2017.] https://tradingeconomics.com/rwanda/unemployment-rate.